Name: Dixon L. Walters, Jr.
Air Force Captain Dixon L. Walters, Jr., 29 of Navarre, Florida, was listed as MIA when the AC-130 Specrte Gunship he was flying in was shot down on January 31, 1991. The Gunship was believed to be involved in Special Forces operations. On March 6, the gunship was found off the coast of Kuwait and all aboard will be listed as Killed in Action when their remains are identified. NOTE: See Thomas Clifford Bland. 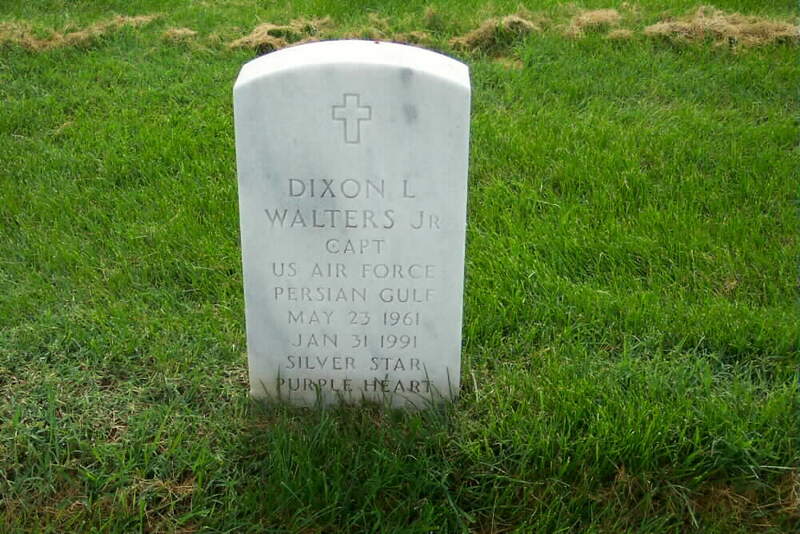 Air Force Captain Dixon L. Walters, died on 31 January 1991 and was buried with full military honors in Arlington National Cemetery (Section 60, Grave 7715). enemy territory when it went down over Kuwait. The crew of the aircraft included Major Paul J. Weaver; Captain Dixon L. Walters; Captain Arthur Galvan; Captain William D. Grimm; First Lieutenant Clifford Bland, Jr.; Tech Sergeant Robert K. Hodges; Sergeant Damon V. Kanuha; Master Sergeant James B. May II; Staff Sergeant John L. Oelschlager; Staff Sergeant Mark J. Schmauss; Staff Sergeant John P. Blessinger; Master Sergeant Paul G. Buege; and Sergeant Barry M. Clark. U.S. Representative Earl Hutto (D-FL) whose district includes the home base of the 16th Special Operations Squadron, Hurlburt Field, later told media sources that the gunship was on a targeting mission, seeking out enemy targets and directing other aircraft to them. Other aircraft heard a "mayday" distress call, but there was no indication of what caused the aircraft to crash. Search and rescue teams were unable to reach the aircraft's location to recover any who may have survived. The crew of the aircraft were equipped with AN-PRC-90 hand-held survival radios, even though a newer version, the AN-PRC-68, might enhance survival chances. The 90, although still in wide use, uses only two well-known international distress frequencies, increasing the possibility that allied rescuers could be decoyed into a deadly trap by Iraqi forces using the same frequencies. The 68 has 2,000 channels and can be modified to provide encrypted speech to frustrate eavesdroppers. Friendly search forces can determine the direction of signals transmitted by the newer radio. The families were notified on the following day that the aircraft was down and that all aboard were Missing in Action. Searches were ongoing for the aircraft and/or survivors, families were asked not to speak to media representatives, and little information is available about the crew or the mission on January 30. The Iraqis have stated that Allied prisoners of war would be used as "human shields" to protect their important military sites from attack by Allied forces. Amidst clearly inflated shoot-down reports issued by the Iraqis, and reluctance by the Pentagon to release premature information, observers wait for news of missing and captured military personnel, speculating on the treatment they will receive as prisoners if they are captured. Those who recall the torture and degradation American POWs were subjected to by the North Vietnamese can only wait and pray. Those who recall the abandonment of American POWs in World War II, Korea and Vietnam are watching carefully, determined that all our men and women will be returned alive, or fully accounted for, before American troops leave the Middle East when hostilities cease.